With each new day, your precious little one’s journey will be full of first new discoveries and experiences. First giggles, first steps, first words, a first swim. But every parent who has had to care for an irritated baby’s bottom knows not every first is a welcome one. So when it comes to caring for baby’s delicate skin, you can trust Hamilton Babies to help keep all the bath and body time firsts perfectly safe and happy. 2-IN-1 SUDSY SENSATION – A gentle formula that cleanses without drying, leaving baby’s skin and hair soft, smooth, and hydrated. Our botanically based Shampoo & Body Wash is a gentle formula that cleanses without drying, leaving baby’s skin and hair soft, smooth, and hydrated. A Blend of Plant Extracts helps support healthy skin development and delivers antioxidant protection. Directions: Wet Skin and hair with water. Pour onto washcloth or hand and apply to hair and body, avoiding eye area. Lather and rinse. Follow with Kissable Karissa Face & Body Lotion. Sodium Olivate- a plant-derived oil that moisturizes and softens skin. Quinoa – moisturizes the skin and is especially good for your hair since it helps repair and revitalize hair, helps prevent tangles, and increase shine, volume, and smoothness. Wet skin and hair with water. Pour onto washcloth or hand and apply to hair and body avoiding eye area. Lather and rinse. Follow with our Kissable Karissa Face & Body Lotion. LIKE ECZEMAGIC – Nourish, calm, and comfort irritated skin with this unique therapy for babies and children suffering from eczema. Fully FDA compliant. Our botanically based Eczema Therapy will nourish, calm, and comfort irritated skin for babies and children suffering from eczema. Fully FDA compliant. Apply as needed to affected area. Use on mild to moderate eczema, or as directed by a physician. BUBBLE OVER WITH DELIGHT – Make bath time a happy time for you and your baby with this gentle formula that cleanses while leaving the skin soft & fresh. Our botanically based Bubble Bath makes bath time a happy time for you and your baby with this gentle formula that cleanses while leaving the skin soft & fresh. Directions: Pour under warm running water for better bubbling. Use the desired amount depending on the number of bubbles wanted. Pour under warm running water for better bubbling. Use the desired amount depending on the number of bubbles wanted. Massage onto baby's skin as often as needed, especially after bathing. 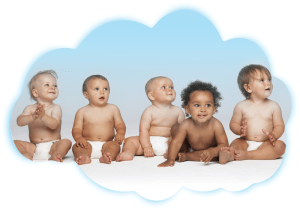 As the creator of Hamilton Babies, I invite you to experience baby care that truly exceeds industry standards in the manufacture of safe and effective products that produce amazing results. Together with my partners at Hamilton Therapeutics, we distribute our naturally-efficacious, pediatrician inspired products to professional baby care providers that enable their parent clients the peace-of-mind knowing what they are using on their child is an exceptional choice in quality and a unique experience in meaningful entertainment. All Hamilton Babies products start with a nourishing blend of Chamomile, Orange Extract, Lemon Peel, Sage and Thyme, and then each one is further enhanced with its own specific natural ingredients for maximum product performance in every category. We test every ingredient for quality assurance and compliance to the highest health and safety guidelines. Our formulations are created using the most naturally effective ingredients available, and tested for performance at every step. Meet our Hamilton mascots! These little cuties were named after our Hamilton Babies company children and grandchildren. Bringing care and comfort to baby’s skin and hair, they also foster a fun learning environment for baby to intellectually grow and thrive. At Hamilton Babies, our mission is P.R.E.C.I.O.U.S. Beyond just providing amazing products, we also strive to create a Hamilton community to promote a healthy and enriching lifestyle for families everywhere.